Guido likes Linux because it is a very flexible and offers much more possibilities than any other operating system. 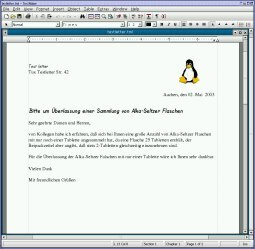 Textmaker is one of the new commercial word processors for Linux. The article reflects the authors opinion and is neither sponsored nor influenced in way by anybody else. The number of word processing applications available for Linux is growing steadily. The most important ones are probably Staroffice, Openoffice, Kword, Abiword, Ted and now also Textmaker. Applix used to be a very nice alternative but declined after Redhat did not sell and maintain it anymore. It is also possible to run Microsoft products using crossover office but then we are not talking about a real Linux application. This leaves us with basically 2 commercial products: Staroffice and and Textmaker (http://www.softmaker.de/tml.htm). I always had a love and hate relation with Staroffice. It has a lot of features but it is very slow and really heavy. I absolutely hate it when Staroffice starts up and occupies the screen for almost a minute with a big logo which you can't click away. You notice also in many places that Staroffice wasn't really a Unix application from the beginning. So I was quite excited when I found Textmaker. It seemed to be quite slim: 7Mb download is an acceptable size. The list of features is impressive for a new office application. Import and and export of documents to all major formats including all versions of word for Windows works without problems. It supports truetype fonts under Linux which means that you can possibly use millions of fonts in any size. 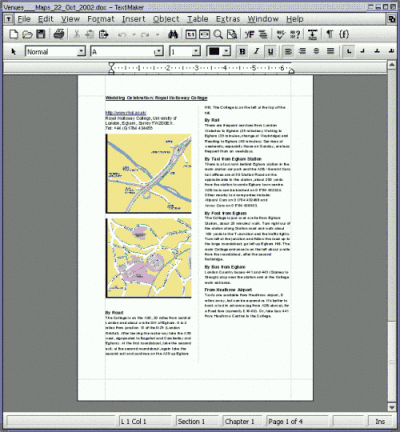 The rendering and printout quality of documents with mixed pictures and text is also very good. There seems to be no support for mathematical formulas or technical drawing which makes it not a choice for scientific applications but it has definitely everything that a home user or business person expects from a word processor. I will not continue to list all the features. Instead I will focus on things that I personally really miss: A fast, lightweight, true Unix office application. With true Unix I mean things like: Runs with no problems from a central installation in a multi user environment. X11 offers a seamless integration of local and remote application so a true Unix application should support that too. When I install an application for the the first time the I always install it just once on a server and the users start it via a small shell script remotely. Home directories are available via NFS so most users will not even notice that this program is not running locally on their computer. The advantage is that I have only one installation to maintain and it does not use memory or cpu on the users workstations. Since everything is in one place it is easier to monitor crashes or hanging processes. How about Textmaker? Textmaker is quite stable no crashes within several days of using it. It uses about 8Mb Memory per running process and does not seem to have big memory leaks. Problems? Yes. The separation between users is not very good. If one user starts a document and does not save it then a second will user gets a notice at startup that there is an unsaved document. If she opens it then she gets the document of her colleague. Rendering of text and pictures on the screen is very slow even if it is running on a fast server. Something is wrong with the way Textmaker updates the screen. I don't type very fast but the text on the screen was always about one word behind my typing. This problem with the rendering of the screen does not seem to exist for a locally started Textmaker. An other point that speaks for it self is that fact that all files in the Textmaker installation are executable (chmod 755), even font files. The happens usually when somebody who has no clue that a Unix file system is different from Windows packs files together under Windows. Textmaker is basically a Windows program that was re-compiled for Linux. Therefore most of the Linux specific things do not work. That is very unfortunate because Linux has much more possibilities and features than Windows. Something that is probably a feature and not a bug is the fact that you can only start one instance Textmaker. It you try to start a second Textmaker process it opens the already running window. It is rather unfortunate that one can not disable this behavior (e.g via command line option). I personally like to have 2 separate top level windows when I copy/paste text parts. With Textmaker I had to use its own small internal text windows. Textmaker supports truetype fonts. That's very good because it gives you access to millions of high quality fonts. Textmaker reads at startup the file /etc/X11/fs/config to find the fonts and something is wrong with that code. On most installations it did not find any font and I had to copy the fonts to /opt/textmaker/fonts. In one case it would even crash during startup. I deleted some comment lines in /etc/X11/fs/config and it started. Very strange. Textmaker shows you a preview of the font in the list where you can select the font. I tried an installation with 248 fonts and it was almost impossible to scroll that list because it was so slow. So finally I decided that is is a good "bug" that Textmaker fails to understand the font-server config file. This way you can copy a selection of fonts to /opt/textmaker/fonts and the list of fonts in Textmaker becomes usable again. The test ended with a mixed feeling. Especially multi user support and remote X11 failed totally. That's a pity because those are really some of the very best features of Unix. On the other hand you won't notice it on an isolated single PC Linux installation at home. Which version did I actually test? Well the home page of Textmaker (http://www.softmaker.de/tml.htm) says Textmaker 2002 but the "about menu point" in Textmaker says 389. What ever that is. In the end I decided to buy a license even though this looks still like beta version to me but I wanted to encourage softmaker to continue. It has the potential to become a really good word processor if they remember to fix bugs before and after adding features. Softmaker should also focus on the integration into Linux. Just re-compile it for Linux is not enough.